So you’ve decided to have a website built for your company? Great! Now what exactly is going to help your website attract visitors and gain traffic? The answer is… content! Both written and visual content is highly important for the success of your website. Therefore, because our first impressions are often what determine whether or not we will stay and browse a certain website, it is important that the design of your site includes attractive, bright, and relevant images to catch your viewers’ attention! Once you’ve decided to have a website developed, the next step is to find or purchase images to include in your website design. One crucial thing to keep in mind however is to make sure the photos you are using are royalty-free images. If your website contains copyrighted photos, you risk facing a number of penalties towards your business such as your website being taken down, or even a lawsuit which can potentially costs you thousands of dollars. Therefore, we highly stress the importance of finding and/or purchasing royalty-free images. So what exactly are royalty-free images and where can one go to find these? 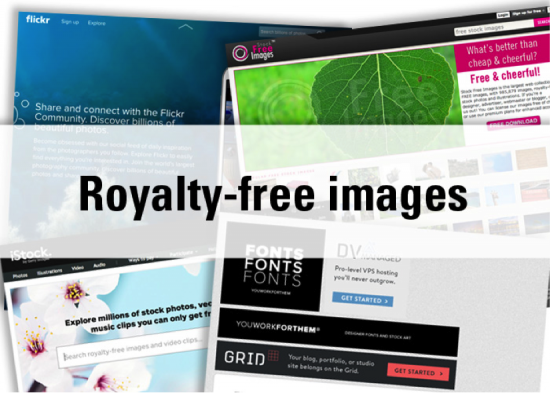 When an image is royalty-free, this means that you may use the photo without having to pay a license fee or royalty charge to the owner or creator of the photo. Note, the owner of the royalty-free image still has copyrights on the photo, however they are granting you permission to use the photo without paying royalties. Although there are websites that offer royalty-free photos completely free of cost, we recommend actually purchasing your images to ensure higher quality and selection of photo choices. Where can I find royalty-free images?